Birds came to it minutes after we hung it! Very popular with the birds! 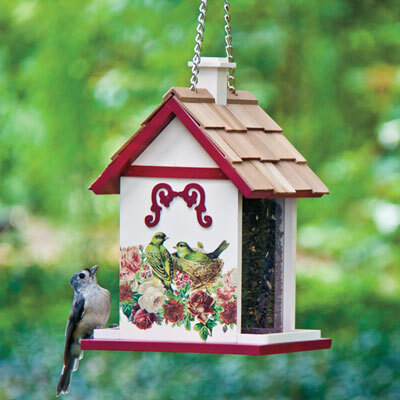 Both ends of this charming feeder are decorated with vintage Victorian roses and birds, set off by rose-red trim and a cozy cedar shake roof. Clear side panels show birds where to come for dinner and let you see when it needs refilling, and the roof lifts easily for filling and cleaning. Attached chain for hanging. Holds 2 1/2 lbs. of seed. 11"H x 7"W x 6 1/4"L.